Batman sets to work out the make-up of the "super-pill," when he's alerted over the computer monitor in the Batcave that Superman is coming for him and he needs to leave. Batman is resolute; he cannot leave until the super-pill has been analyzed. Again the voice on the monitor implores him to leave, but it's too late for escape, as Superman has arrived. Superman and Batman begin a conversation. Superman declares Batman as mad as the insane clowns that terrorized Gotham. Batman responds that Superman is delusional. Superman snatches Batman by the throat, warning Batman to tread lightly. Batman notes that Superman could have killed him if he wished to do so, and notes the blood of Green Arrow on Superman's outfit. Batman is desperately trying to buy time for the analysis to be complete, and so he tests Superman's emotions by showing him footage of his wedding to Lois Lane. Batman hides in the recesses of the Batcave, while continuing to taunt Superman. He tells him that he failed to save Lois; to honor and protect her. Batman then hits Superman with a sonic device, overloading Superman's super-hearing and summoning the bats within the cave. Superman burns through the bats, while Batman makes a dash for the super-pill, which is nearly finished being analyzed. Superman catches him before he does. He strips Batman's mask off and concedes that he's not there to kill him, but he says that he cannot have Batman being a loose cannon either. Superman raises Batman above his head, and brings him down on his knee, breaking the Batman in doing so. Story - 4... OK, 5: Many, many moons ago there was a comic book by a new name: a graphic novel. On the cover of the graphic novel was an image of Batman looking really beat-up, a very grotesque sight. It was passed over for something less ugly. The next month was the 3rd issue of the series, with the Batman symbol and a girl dressed like Robin on the cover. That was more pleasing to the eye, it was purchased. What was inside was mind-blowing, and something that the reader, being very, very young, should probably not have been reading at that age. The violence, the sexual imagery, it was all very stirring and very influencing... then came the closing issue. Batman and Superman don't fight, is what the mind said, but here they were, fighting like this was an issue of X-Men, and they had traded places with Cyclops and Wolverine. A Batman fan was born that day. Superman was still cool, but Batman, the tortured soul that he was, the resourceful human being that trumped the Man of Steel, that was a character worth getting to know more about. However, the more that was revealed of Batman, the less there was to like. Batman wasn't just tortured, he was unwell. What is more, he was never going to get better. The Dark Knight Returns has an unintentional pun, as "returns" insured that Batman would remain a mentally unhinged character, who didn't know friend from foe, just ask Alfred. It also meant the marginalisation of Robin, and the abandoning of Superman. The irony is that while Superman was said to be too powerful, Batman increased in power and ability, to the point that today he can knock-out a charging horse with one-punch. Superman was struggling to lift planes on Superman: The Animated Series; Batman was dodging Darkseid's Omega beams. The more powerful character is usually the more popular one, and Batman proves the aforesaid, but Superman attracted a reader because he was good; he was a hero because it was right, not because of trauma or guilt, and he wasn't a jerk. He was the adult in the room, the one you could grow up to be, if you could get past the influence of the adolescents around you sneering at him. Still, if Superman was the better hero, and the better character, he sure took it in from Batman. Batman could pick Superman's pocket. Batman could Judo flip Superman into a wall; He could steal away Lois Lane as well. Batman could harpoon Superman with Kryptonite from a motorcycle. Batman was better than Superman; not only more popular, but better. It's unacceptable to anyone who knows Superman, and though one could argue for days that Batman beating Superman was impossible, the response wasn't even verbal: it was one of two images, from either TDKR or HUSH, showing Batman throwing a haymaker and Superman taking it like a good boy. First, a fan wants parity, but after years of abuse, you want revenge. You want the pound flesh that has been taken since Miller made your hero a stooge and a riding horse for the Bat. This installment delivers just that. It's buffered well enough, the ploys that the Batman uses. The psychological tactics, the sonic weapon against super-hearing, all the tricks to be expected from years of seeing such things works. This time it doesn't. The reason is obvious: Batman can't beat Superman... at least not without Superman being compliant in some form or other. Here, Superman isn't giving Batman anything in the slightest. He wants to take him out, and he does so regardless of Batman's craftiness. The fact that he doesn't kill Batman, after killing all the others, including Green Arrow, is dishonest to say the least. Batman's popularity saves him more than anything else, and you can imagine Martian Manhunter bemoaning the fact that for a little more promotion, he'd still be alive. The sweet revenge of it all is succulent, but, as the saying goes, short. The fan in me can indulge in this act to no limit, but the super-fan looks on with shame. Somewhere, there's a wee lad who, like all of us, is reading comics. 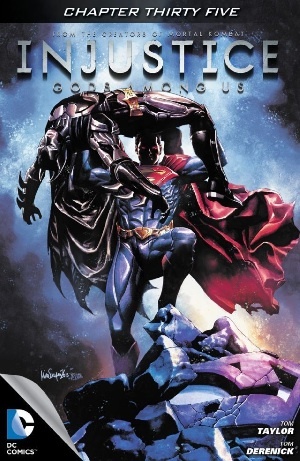 He's got his hands on his brother's iPad or laptop, and is perusing whatever's there, and comes across the cover of Injustice: Gods Among Us - Chapter #35. Intrigued, he opens and scrolls to the ending of the issue, which brings me full circle with TDKR, but places a new reader, a younger reader in front of Superman, much as Batman was placed before many in that fateful graphic novel. Is it fair to the younger reader? Is it fair to Superman? The answer is obvious, but for now, here's to hoping that the sweetness doesn't come with a lingering, bitter aftertaste. Art - 4: It's good that Derenick was on for this installment. He renders Superman to look imposing and straightaway scary. Batman actually looks afraid (more sweetness), and the final splash will be Internet fodder for years to come. Cover Art - 4: Take the cover and the splash and you've got yourself a new moving image avatar.